Please type your desired tags, e.g. Physics, Biochemistry and Biophysics, HiC, Inquiry, Gerontology, Social Change, Poverty, International Development, History of the Book, Gender Studies, Culture, Deconstruction, Eighteenth century French intellectual and literary history, Translation studies, Genre theory, and etc. Design and fabrication of photonic crystals in optical and MW bands for device application as switches. Tunable photonic crystals based on new carbon forms, conducting polymers and ferroelectrics, particularly for applications in optoelectronics and microwave antennas. Member of Membership Committee of the International Society for Molecular Electronics and Biocomputing (1989-1992). International Conference Electronics of Organic Materials ELORMA'87, Tashkent, Nov. 1987 Sci Secretary. ICSM'92, (Gotheborg, Sweden); ICSM'94, (Seoul, Korea): ICSM96, Snowbird, Utah, USA: Mem Int. Adv. Com. Int. Winterschool "Electronic Properties of Polymers." Kirchberg, Austria, 1991: Program Committee. Nanotechnology scientists at The University of Texas at Dallas (UTD) have won two federal research grants totaling more than $500,000, the university announced today. The largest of the awards is a three-year, $460,000 grant from the United States Air Force Office of Scientific Research to three members of the UTD faculty to produce prototypes of photocells from polymer nanofibers and carbon nanotubes. The co-principal investigators on the grant are Dr. Anvar A. Zakhidov, professor of physics and associate director of the UTD NanoTech Institute, Dr. John P. Ferraris, professor of chemistry and head of the Department of Chemistry, and Dr. Kenneth J. Balkus, Jr., professor of chemistry. The goal of the research is the creation of low-cost, ultra-lightweight, deployable solar cell arrays that could be used to generate electric power for spacecraft, among other applications. 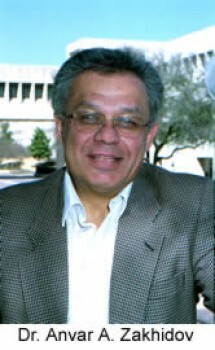 Dr. Anvar A. Zakhidov, professor of physics at The University of Texas at Dallas (UTD) and associate director of the UTD NanoTech Institute, will receive an "Asian-American Engineer of the Year" award from the Chinese Institute of Engineers/USA (CIE/USA) when the national organization holds its annual awards banquet in Dallas next month. Zakhidov is one of 14 prominent scientists and engineers from throughout the United States to be selected to receive the award, which recognizes significant contributions by Asian-Americans to engineering and the sciences. Specifically, Zakhidov will be honored for his efforts to advance nanoscience and nanotechnology. The awardees work for a wide range of organizations in the public and private sector, including IBM, Boeing, Raytheon, General Motors, Lockheed Martin, Cisco Systems, Los Alamos National Laboratory and the U.S. Navy. 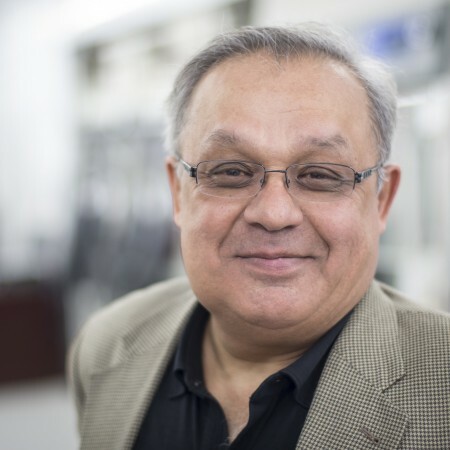 Lauded for his landmark advancements in nanotechnology, optics and the science of physics as a whole, Dr. Anvar Zakhidov has been named a fellow of the American Physical Society (APS). 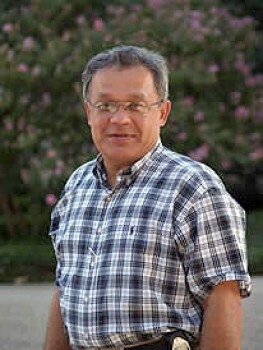 Zakhidov’s distinction, in the society’s materials physics division, will be made public in the March 2010 issue of APS News. Members are nominated by their peers. Zakhidov’s annual citations—a yardstick by which the quality of research is often measured—have increased in the past decade from about 200 per year to more than 800 annually. Thirty of his 240 publications have been cited at least 30 times. Two researchers from The University of Texas at Dallas last week were awarded the prestigious Kapitza Medal by the Russian Academy of Natural Sciences for the pair’s breakthroughs in the field of nanotechnology. The medal is the highest award given by the academy for a major scientific discovery. Dr. Ray Baughman, director of the UT Dallas NanoTech Institute, and Dr. Anvar Zakhidov, associate director of the institute, were honored at a ceremony in Moscow before an audience of nearly 400 scientists and engineers from approximately 40 universities and research institutes throughout Russia. Zakhidov, a native of Uzbekistan, part of the former Soviet Union, was also inducted into the academy as a foreign member. Baughman was similarly honored a decade ago. A scientific paper on improving polymer solar cells, authored by Dr. Anvar Zakhidovand colleagues at The University of Texas at Dallas NanoTech Institute, was selected one of the “Top 5 Hot Talks/Cool Papers” submitted at the 2007 spring meeting of the Materials Research Society held last month in San Francisco. The honor was announced last week by the society. The paper, published recently in the international journal Solar Energy Materials and Solar Cells, describes the efforts of NanoTech Institute researchers to build organic solar cells utilizing sheets of carbon nanotubes that collect a greater amount of energy from sunlight than other photovoltaic devices. The UT Dallas scientists have demonstrated the ability to double the collection efficiency of organic solar cells. Synthesis of "quantum dot-conducting polymer"